Blended for Australian Tastes since 1883. This a well-rounded, full flavoured tea for a good Australian cuppa any time of day. 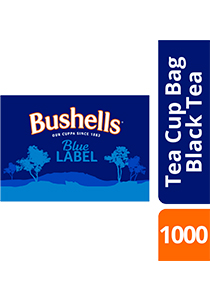 BUSHELLS tea has been enjoyed by Australians for generations. The tea is easy to prepare. Infuse 1 tea bag in 200mL of boiling water for 2 to 3 minutes. Add milk or sugar as desired. This product comes with inner cartons of 100s. Giving Australians a good cuppa since 1883. Bushells' full flavour has been enjoyed by Australians for generations. A well-rounded, full flavoured tea blended for Australian tastes. Choice small leaf tea. Catering pack. Place one tea bag for each person in a cup. Pour in fresh boiling water. Allow to infuse for 2-3 minutes. Weight per serving/portion - 1.8 g.